On 27 November 2015, the European Union Advisory Mission and OSCE Project Co-ordinator in Ukraine organized the second meeting of the “Parliament-Civil Society Platform” on the topic “Constitutional Reform in Part of Judiciary: Fair Wind and Hidden Pitfalls”. The event was held in the hotel “Hilton” in Kyiv and brought together over 100 officials, parliamentarians, experts, civil society activists, judiciary and journalists to discuss the judicial reform in Ukraine. There were three topical sections at the meeting: “Сonstitutional reform regarding justice: overview of key novels”, “Renewal of Judiciary: political myths and reality and “Access to justice: Quo vadis?”, in which experts from the EUAM, OSCE PCU, UA authorities, CSOs discussed issues that are not only of professional interest, but of an unmistakable and significant impact on the reform process in Ukraine. 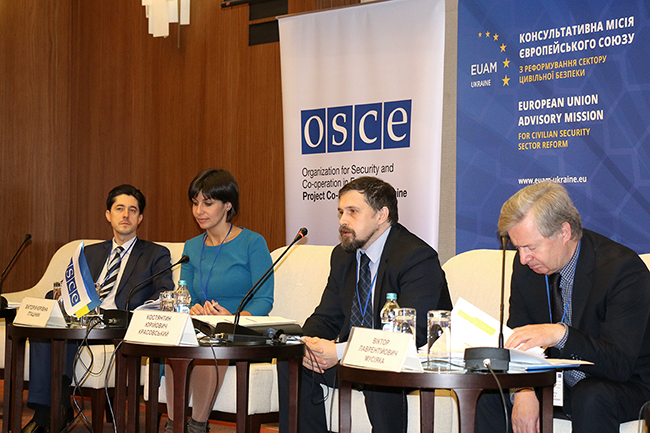 In his opening speech, Hugues Fantou, the Acting Head of EUAM, stressed the importance of the permanent dialogue between the public and Ukrainian officials, saying that: “The EUAM has supported, along with the OSCE PCU, the discussions around the reform process involving all stakeholders. In this context, it is important to create a forum for a broad discussion in order share different views and reach a common understanding on upcoming constitutional changes in the area of judicial reform”. In his turn, H.E. Vaidotas Verba, the OSCE Project Co-ordinator in Ukraine, stated that: “The more people know about the ongoing judicial reform, the more they trust the justice system after intended changes are implemented. And this is an extremely important condition for the ultimate success of this transformation. That is why the OSCE Project Co-ordinator in Ukraine is supporting on an ongoing basis an open dialogue around the planned amendments to the Constitution with regard to reforming the justice system”. The invited keynote speakers included among others: Yaroslav Romaniuk, Head of the Supreme Court of Ukraine; Vitalii Kasko, Deputy Prosecutor General of Ukraine; Ihor Benedysiuk, Head of the Supreme Council of Justice; Serhii Kozyakov, Head of the High Qualification Commission of Judges; Bohdan Lvov, Head of the High Commercial Court; Borys Gulko, Head of the High Specialised Court on Civil and Criminal Cases and other experts from public authorities and civil society. The “Parliament-Civil Society Platform” initiative is a response of the European Union Advisory Mission and the OSCE Project Co-ordinator in Ukraine to the challenges posed by the reform process in Ukraine in general, and the civilian security sector reform in particular. The Platform will promote transparency, efficiency and accountability of the reform process, and cascade the reform debate to local counterparts, thus ensuring the local ownership. The format of the Platform envisages the regular thematic discussions involving parliamentarians, experts, scientists, government officials, NGOs and public representatives on the topics on the reform agenda of major public concern.